To view schedule and heat draws for September 16, click here. The 2018 Urban Research ISA World Surfing Games (WSG) was officially inaugurated by ISA President Fernando Aguerre today in a display of team spirit and camaraderie in Tahara, Japan. Thousands of locals took to the streets to cheer on the 42 nations represented by the 197 surfers participating in the event. Notably, The Chief Operating Officer of Tokyo 2020 Yukihiko Nunomura and the Sports Director of Tokyo 2020 Koji Murohushi were in attendance to show support for Surfing ahead of the sport’s Olympic debut in the Tokyo 2020 Olympic Games. “In a world of conflict and difficulties, it is great to see so many nations and surfers come together and to celebrate peacefully the power of Surfing to make a better world. “The 2018 UR ISA World Surfing Games are particularly special because we are in an Olympic cycle. For more than 20 years we paddled to catch that elusive wave and we finally did it, including Surfing in the Tokyo 2020 Games. Also, this edition is historic due to that fact that men and women slots are equal, showing our commitment to gender equality in Surfing. “Some of you will go home with a medal around your neck, but most of you will not. However, everyone has this amazing opportunity to represent their country and make friendships that can last a lifetime. The Parade of Nations kicked off the festivities, as each National Team marched through the streets of Tahara waving their flags and ringing out national chants. 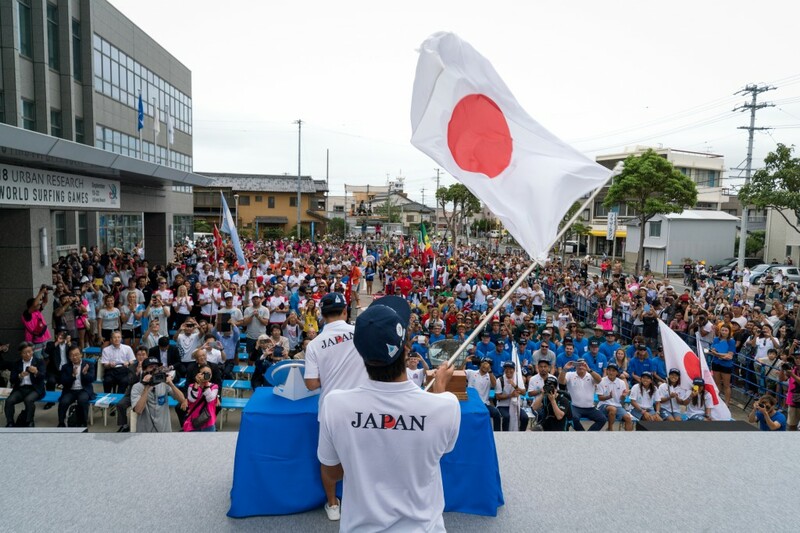 The parade arrived at the Opening Ceremony stage, where the athletes were greeted by delegates of the ISA, Prefecture of Aichi, City of Tahara, the Title Sponsor Urban Research, the Nippon Surf Association, and the Tokyo 2020 Olympic Games. Following the Parade of Nations, the ISA celebrated its signature Sands of the World Ceremony in which two members from each team took to the stage and poured sand from their local beach into a glass container while waving their national flag, symbolizing the peaceful gathering of nations of the world through Surfing. The international delegations were treated to a traditional Samurai performance to give them a taste of the local culture and tradition of Tahara. Competition will get underway with the Open Men and Open Women divisions running on the dual podium format.